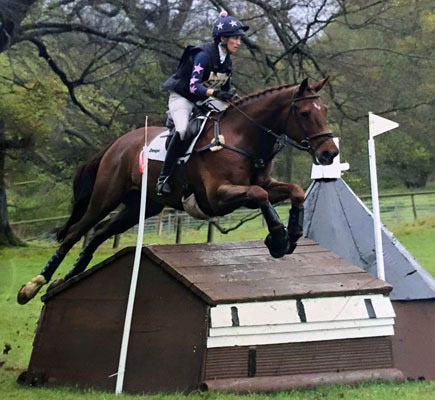 Cher East owns ten-year-old Alfie, a 17hh ISH x WB with a bit of an identity crisis! At a recent BE event, a lady approached Cher to ask if Alfie was for sale, as she thought he’d make a lovely working hunter. Although very genuine, Cher describes Alfie as being lazy when hacking and schooling, only doing just enough to get over the fences. Despite this, he is in medium work, including schooling, jumping and hacking for six days a week, plus competing at BE100. He was fed on a diet of Dengie Alfa-A Oil, naked oats, a broad-spectrum vitamin and mineral supplement and additional supplements for joints and hooves. Alfie was turned out on good grazing for six hours a day and was given 3.5kg of haylage in his stable that was triple-netted to slow his rate of eating. Determined to get Alfie looking like an eventer again, Cher called the Dengie nutrition team and Performance Horse Nutritionist Claire Akers came out to weigh Alfie and Cher’s other horses. She condition-scored Alfie at 3.5 out of 5 and he weighed in at 712kg. After assessing Alfie’s diet, Claire suggested that Cher change the Dengie Alfa-A Oil to two scoops of Alfa-A Lite per day. Alfa-A Lite has a lower Digestible Energy level (10MJ/kg) compared to the Alfa-A Oil (12.5MJ/kg) – energy-wise, this is the equivalent of changing from competition cubes to high fibre cubes, but in a much more natural fibre format. Claire also recommended that Alfie’s turn-out be reduced to four hours and that Cher change her supplements to Dengie Performance Vits & Mins, which is specifically tailored for horses like Alfie that do a high level of work, at a rate of 90g per day. Cher made the changes to Alfie’s routine and when Claire returned a couple of months later to check on his progress, they were both delighted to find that Alfie now weighed 688kg and condition-scored the ideal 3 out of 5.